If you have RSVP’d to attend the Spring Teaching & Learning Day on May 3rd, please listen to this Dave Matthews Band song, linked from their official YouTube account, as we ask you to ponder something. Our Teaching & Learning Day will take place at our FROST CAMPUS! We look forward to seeing you on Wednesday at our FROST Campus. In Lindsay. West of Sutherland Campus by about 44 km. 200 Albert St. South. Lindsay. More details on the day are available here. And now, on to the Best of the Hub, Winter 2017! Winners are based on these results. Winner: Best “Engaging Teaching” Section of the Semester: Week Eight and the Open Faculty Patchbook kick-off! We have been working on developing an open textbook for faculty development. The idea is that the textbook, or manual, will be written for faculty by faculty. It’s a patchwork. A community quilt. A collection of “patches” (like chapters) with each individual patch telling the story of one pedagogical skill. Patches can showcase pedagogical skills for teaching in class, online, or (likely) both. It could cover designing or redesigning lessons and courses, or show how to use specific tools. Whatever the community quilt needs to cover our teaching and learning needs can be added. On Wednesday, at our Teaching & Learning Day, we will ask you if you’d like to craft a patch of The Patchbook. See the beginnings, and more details here. The meat & potatoes of D2L is the content area. All the stuff should be there: PowerPoints, html files, readings, videos, dropboxes, quizzes, & discussion boards. Here are some instructions for making best use of this digital landscape. Did you know you can get to content in just 2 clicks upon entering D2L? This is very exciting news for those of us who are frugal with our clicking. Here’s how: 1) click course name. 2) Click “Content Browser” in the widget header. Winner: Best “Learning Technology – Non- D2L” Section of the Semester: Week 13 and the %^&* Profanity Filter! As this is the “no cussing” edition, we decided to feature a simple way to clean up “your” internet by adding a profanity filter to your web browser. In this example, it is a Chrome filter. Click here for more information on WebCensor. Winner: Best “Policy & Procedure” Section of the Semester: Week 2 and HR’s De Rigeur Training! De rigeur: Required by etiquette or current fashion. De rigeur Training: training required by etiquette or current fashion and also because you definitely have to do it. If you are new to Fleming or haven’t done your de rigeur training yet, you can be paid for your time! For more details about all of this, see this page on the HR site. Winner: Best “College Department” Section of the Semester: Week 2 and The IT/AV Team! This week, we held a contest in the foyer at Sutherland campus for the honour of college department of the week. The contest was simply who could hold their breath the longest. Our budget was completely diminished last week when we hosted it in Norway. Travis Grant from IT/AV Customer Support held his breath for 17 minutes to win the competition handily. Here is what they would like you to know: This semester, IT/AV has begun sending very helpful emails with the subject heading “AV information for teaching at Fleming College” which includes information specific to the room(s) in which you are teaching so that you know what you have to work with in your classrooms. These emails include a link to the instructional video below (starring someone that might be Steve Higgs, or it might be Terry Greene. Who’s to say who it really is?). This week’s hub is dubbed the New Addition Edition for good reason. It’s because we have a new, younger, and shinier sibling blogging alongside us: Introducing The Student Hub! If you haven’t guessed yet, it’s written for (and soon by) students, in a similar vein to the Teaching Hub. Check it out here, and let us know if you’d like to get involved in it. The pay is great. Winner: Best “Professional Development” Section of the Semester: Week Five and Taking a Hike. Here’s some informal PD that you can do at your earliest convenience: grab a peer and go for a walk in the woods to chat about how things are going in your classes. That is why we installed forests with trails next to our campuses. Just talking about what you are doing in your classes can help both of you work out some kinks in your plans, or get some new ideas. 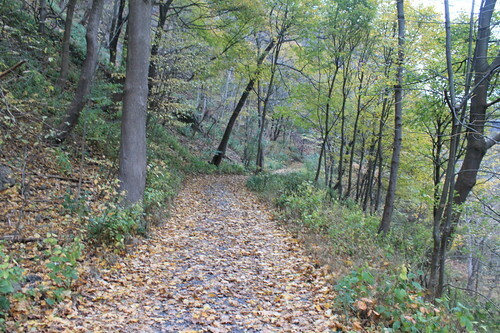 Literally walk a trail, as you discuss and think about new paths to follow in your pedagogy. To help us get all trail meta, we’ll have some fresh new trails to tread at Sutherland campus soon, as part of the Canada 150 Trails project! And then students responded to the flawed statement in the same space. Here is the before and after of the google doc. Now the students can see a chorus of explanations on how the statement is flawed. Cool stuff. Winner: Best “Contact Information” Section of the Semester: Week 4 and Jodie actually doesn’t like Black Mirror. Looking for more information, or want to chat with Jodie about your favourite episode of “Black Mirror”? Visit the LDS Team website, give us a call at extension 1216, follow us on Twitter @FlemingLDS, or send us an email: LDSTeam@flemingcollege.ca!